The problem with going shopping when you’re hungry is that many many things on the shelves of the supermarket look like a good idea. Not Coles, everything there looks appalling and I hate them, but that’s a whole other rant. I’m talking about Harris Farm. Wonton wrappers are amazingly cheap and come in a neat little cube, and I have a thing for the square form. So I’ve had a packet of wonton wrappers sitting in my fridge now for nearly a month and it’s time to either use them or write off that two dollars seventy. First I tried baking them as tart cases, I’m pretty sure I’ve seen them used like that in the a gourmet Traveller magazines I read at the physio. I have a pan from my Nanna’s kitchen that I think you’d use for jam tarts. Twelve depressions, smaller than muffin size, with a rounded bottom. I spray the pan with oil, line the depressions with wrappers, then spray again. 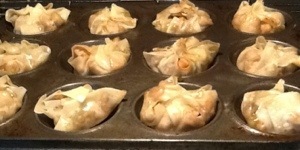 After fifteen minutes in the oven they’ve all puffed up in the middle. I think if you sprinkled them with salt or brushed them with teriyaki sauce first they’d make a rather tasty snack. Still, there’s enough that are vaguely tart shaped that I can later fill them with the bacon and egg that the Horror has requested. Next I chop up chicken, celery, leek and mushrooms and stir fry it with chopped ginger, chili paste, teriyaki sauce and a chunk of palm sugar. Then I have to pick up the boys from their various afternoon activities, and that kind of neglect does make a wonton wrapper dry out a little. I salvage enough to line the pan again with another twelve wrappers and drop spoonfuls of the chicken mixture in the middle. It’s very easy to pinch the wrappers together at the top with wet fingers and they look rather delectable. I spray them with oil, then bake them for twenty minutes. You just need to crisp them up, they’re cooked on the inside. The next lot I’m going to line the tart tray and fill with left over BBQ chicken. I’ll bake that for fifteen minutes then top it with chopped lettuce and capsicum, because that’s what the Moose and the Muffet have requested. I’d better get cracking because I have a committee meeting to get to. I can go with my head held high, because I did manage to get that Treasurer’s report written after all.